Robotic surgery is a technological development using the robotic system to aid in the surgery. It is designed to enable surgeons to perform delicate and complex operations through a few small incisions with increased vision, precision, agility and control. Bangkok-Phuket Colorectal Disease Institute of Bangkok Hospital Phuket gears up for the world’s most advanced medical technology. We proudly introduce robotically-assisted surgery (da Vinci), making us the first and only hospital in the Bangkok Hospital Group and Southern Thailand to blaze a trail. 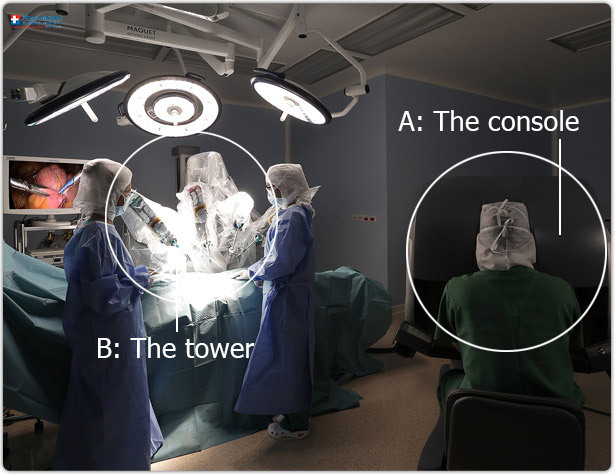 The robotically-assisted surgery results in ever more effective and safer surgery, through robotic arms and 3D, High-Definition (HD) visualization. Should I consider the robotic surgery? Most cases could employ the robotic surgery but it may not be suitable for everyone. Before making any decision, you should be aware of all options available to you. Understanding the risks of each treatment can help you make the best decision for your individual situation. Surgery with the robotic surgical system may not be appropriate for every individual; it may not be applicable to your condition. Always ask your physician about all treatment options, as well as, their risks and benefits. Only your physician can determine whether da Vinci surgery is considered for you. With a less blood loss and fast recovery, da Vinci is an option for a patient who is concern about his pain after the operation. In a traditional open surgery, the surgeon will make at least 10-12 inches incisions of the heart surgery in order to access to the heart by splitting the breast bone and spreading the rib cage. This approach is prone to infection and painful, as well as, takes prolonged time for recovery. After the robotic surgery, the patient recovery is faster and the hospital stay is shorter. The robotic-assisted surgery enhances the surgeon’s view and control over the surgical instrument. Clinical studies suggest that the system may help surgeons provide better clinical outcomes. It has proven benefits in reducing the risk and complications associated with open surgical procedures, thereby extending broader population of patients. The major risks of this advanced technology are not greater than the typically open surgery. In certain circumstances, the robotic-system procedures may be associated with a lower complication rate. The robot is still high-level and sophisticated for the surgeon in the operative system. The major drawback of the computer-assisted system is the loss of tactile and force feedback. This can be surmounted by training and is partially compensated for by the 3-D visual feedback. Unfortunately, it is the fact that not all hospitals can afford the high cost of the da Vinci surgical system. However, the cost is expected to decrease in time.